So much has happened in the last couple months. 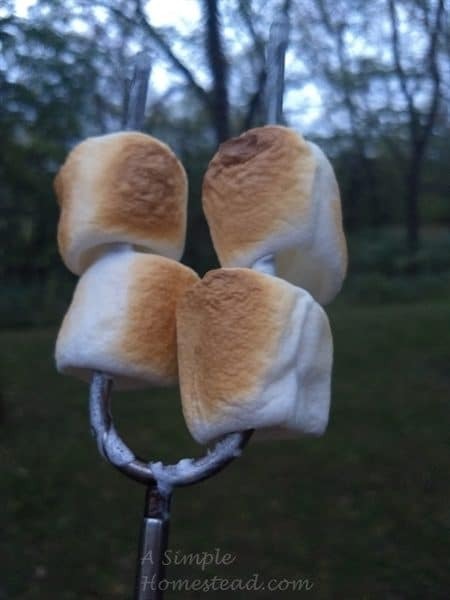 We went camping at the beginning of August like we do every year. This year it was a time of joyous celebration for seeing friends we don’t see often enough – and a few we haven’t seen for years. But sadly, it was also when my best friend announced that she has pancreatic cancer (she just found out herself). She’s only 59 years old. 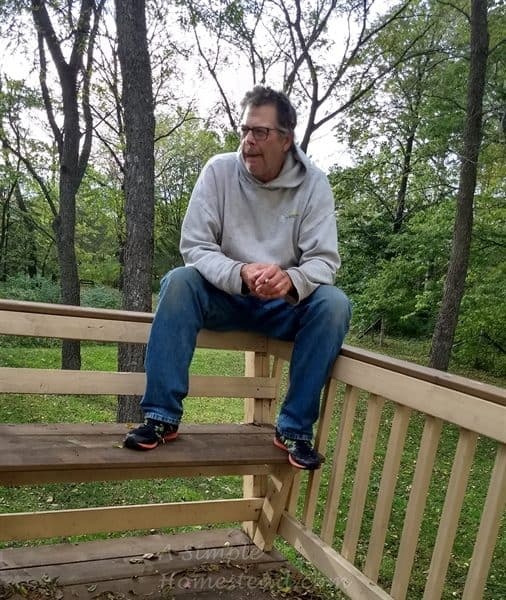 Pancreatic cancer as you may know is terminal – it’s not a question of “if”, but “when” the person dies. I don’t know of anyone else who lives out their faith more than my friend and so I’m not worried about her future (neither is she) – but I’m grieving just the same. It’s not a great picture, but after I made it, I pretty much had to deliver it right away. It’s a “poop bouquet” – as in everything in there will help move things digestive-wise, which can be a problem for people on chemo. 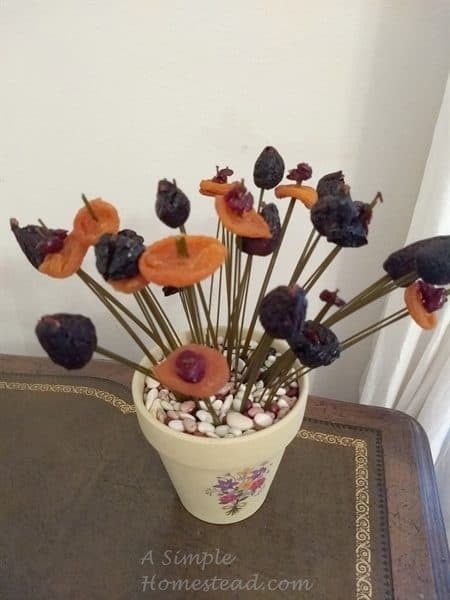 I took a clean pot, a variety bean mixture for the soil/rocks, some green (kale/spinach) dried pasta for the stems and the flowers are prunes, figs, apricots and craisins. I even wrote a little poem. Goofy and totally unappreciated by some in this household – but she got a kick out of it which is what counts. 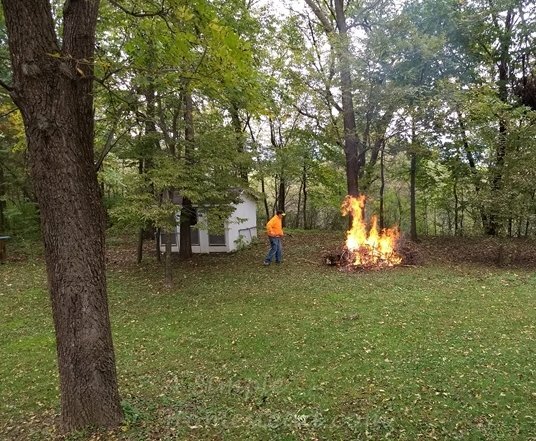 Today was brush burning day – the perfect combination of plenty of recent rain, no winds, cool weather. The gardens were also cleaned up this afternoon. Papa dug up the potatoes – approximately 3 gallons, but then we also ate some of the potatoes earlier this summer. 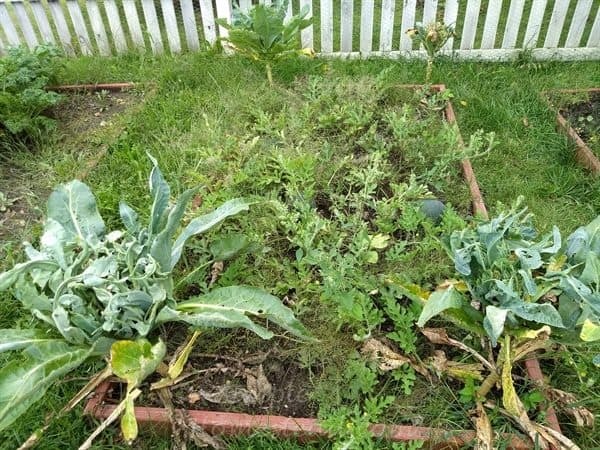 The kale got to the point where it got away from me and the chickens didn’t seem interested so that went in the brush pile too. 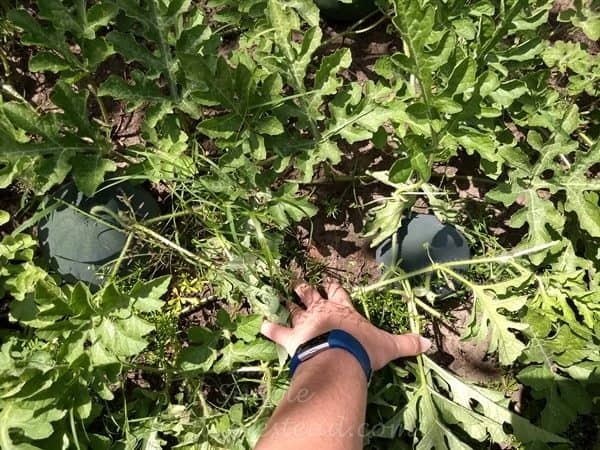 We had high hopes for the watermelon plants but something happened. Maybe it was all the rain we had Aug/Sept but they basically rotted on the vine. We managed to salvage one plus the one we ate earlier this summer. Not a great production. The cauliflower was a complete bust. It never started to produce heads – and then we had some type of insect eating all the leaves. That’s ok – we hadn’t planned on growing those anyway (it was a purchasing mistake). I am going to miss my tomato plants though. I’ve been eating salad pretty much every day and having tomatoes available all the time as a topping has been wonderful. 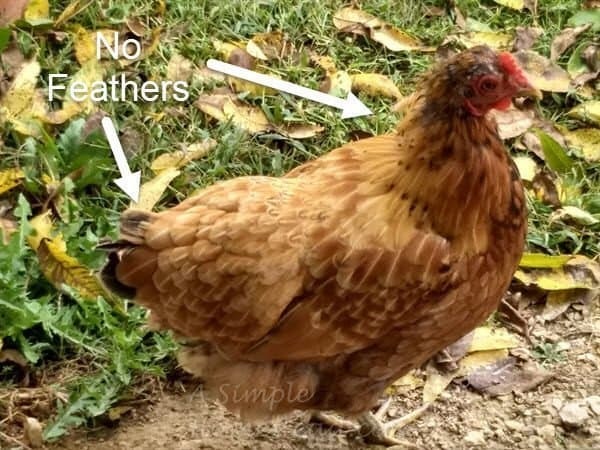 Poor Brun just looks awful, but really ALL the chickens look pathetic. They are molting. It seems early this year so I hope it’s not a sign that we’re going to have a long winter! These two months have been filled with lots of rain, several severe thunderstorms with straight-line winds. We were spared but there were areas just to the south of us that suffered horrible losses due to flooding. 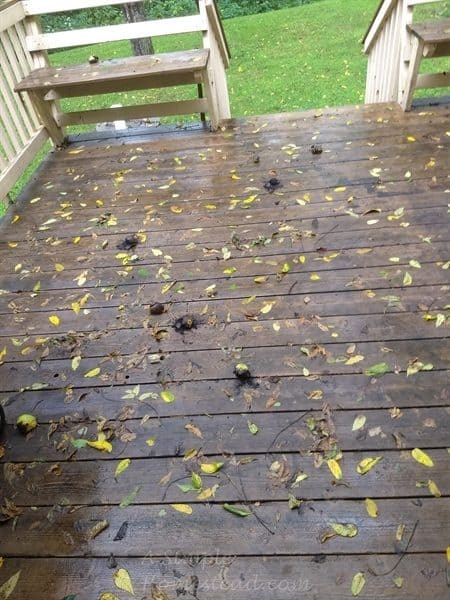 Our deck has been a constant mess this past month – the black walnut trees were close to losing their leaves and their nuts. Those black walnut husks make a horrendous thud when they land – day or night (but it seems to be common after dark!). It doesn’t help with the squirrels “assist” them falling so they can pick them up. You know it’s the squirrels when they fall almost rhythmically LOL! A couple of days ago Papa picked up some apple “seconds” (imperfect) from a local orchard. 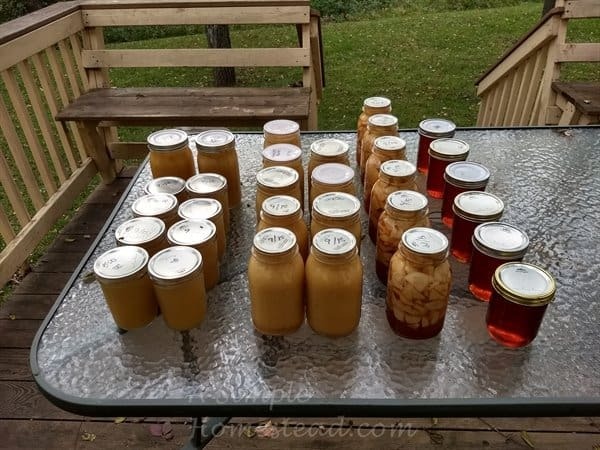 He then spent all day Thursday processing – the left 4 rows are all apple sauce in pints and quarts, the next is apple pie filling and the last is apple jelly that he made using the cores and peelings and some homemade pectin. It was an experiment and seemed to have worked pretty good; the jelly isn’t a firm gel, but it will work for our purposes. We haven’t made applesauce for a few years and I’ve missed it. 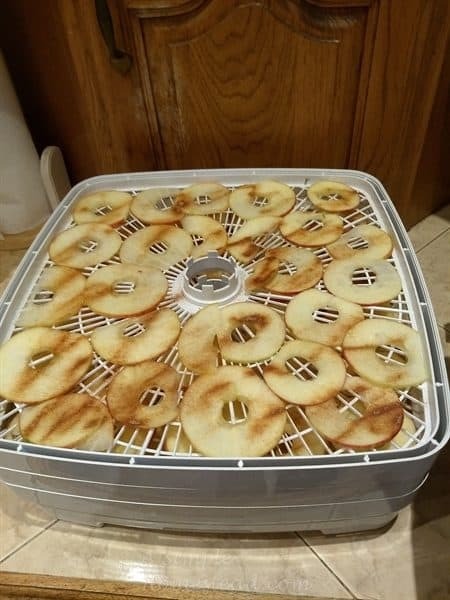 So now we’re doing several batches of dried apple slices. I love these things. Papa prefers the ones with cinnamon but I like them with or without cinnamon. They won’t last long in our house! One last treat before bedtime. 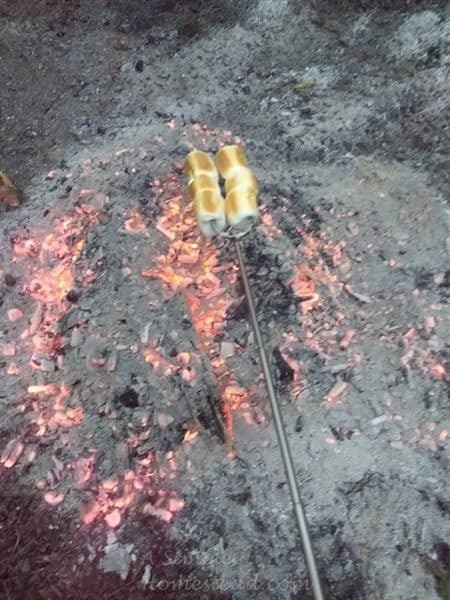 Burning earlier in the day => hot coals perfect for roasting => marshmallows for an after-dinner snack!